Mint (Botanical name - Mentha) is a herbal plant that grows vigorously with minimal care. The leaves very fragrant and have a strong aromatic taste, which are used for many dishes in kitchen. The mint flowers are tiny white, purple, or pink. Br/>Read below to learn how to grow mint from cuttings and seeds in containers or ground or in water, and taking mint plant care for pests and other problems. 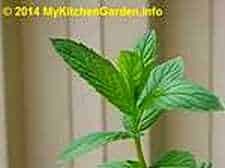 Growing organic mint herb is quite easy if you follow the tips and instructions given below. It can be started from stem cuttings and seeds in pots indoors or outdoor. Mint has several varieties including spearmint, peppermint, sweet mint, lemon mint, lime mint, curly mint and chocolate mint. The Spearmint, commonly used in cooking has a milder flavor than Peppermint which has a strong aroma. The mint is quite hardy, frost tolerant and surviving all the weathers even US zones 5 though 11. Mint is planted in spring or early autumn so that the plant can establish before winter. However, it can be planted at any time in the growing season. Mint grows quite vigorously, and if planted in ground will soon spread to cover a large area of the ground. Actually it becomes difficult to check its spread, it will take up your other garden beds area and lawn like a weed. It is, therefore, best to grow mint in a pot. You can place the pot indoors in your kitchen in a bright location. I grow my mint in a Styrofoam fruit container. Growing mint in pots is very convinient. If you wish to plant the mint in a garden bed, first submerge a container about 5 inches deep so the plant's roots are contained and do not spread. Mint tolerates a wide range of conditions, from partial shade to full sun. Morning sun and partial afternoon shade is best for growing mint. Plant your mint plant in a damp area of your garden. In the winter, you can bring the pot indoors to get fresh leaves. Mint needs a fertile loamy soil with a soil pH 6-7. I add a few granules of water retaining crystals, cow manure and compost to the soil before planting and a handful of cow manure every year. No additional fertilizer is needed for the growing mint. A liquid feed can be given to grown up plants, once a month. Note that too much organic matter in your soil can cause fungus and other diseases. Although some mints can be propagated by seed, but growth from seed is unreliable. For growing outdoors in ground, plant one or two cuttings from the runners of healthy mints about 2 feet apart. Take a stem cutting of the mint, a 4-5 inch long with some roots from your friend's house or buy a small plant from your garden shop. If growing in a container you will need only one cutting. I have also grown mint from cuttings of the mint that I buy from supermarket. I just removed all the mint leaves and put the stems in damp soil in a pot. They sprout in about a week. You need not to use any rooting hormone. You can also place the cuttings in water and see the roots developing. Add mulch on top of the soil to keep the roots moist. I use sugar cane mulch which slowly decomposes into the soi (A guide to mulches)l.
Water the plant regularly to keep the soil evenly moist. The water crystals added in the soil and the mulch will retain moisture in the soil and keep the roots cool. Do not over-water, soggy soil causes plant disease problems. How to take care of mint plants? caringn mint plants is very easy. I planted mint in a container about 15 years ago, and still the plants are healthy. Mint is a "plant and forget" type of plant, needing minimal care, except watering. Cut the growing tips periodically to promote bushy growth. This will also deter flowering. Pinch off any flower buds. Powdery mildew, Rust, Leaf spot, Anthracnose, Stem canker. They are susceptible to white-fly, spider mites, snails and slugs and diseases like rust, powdery mildew and leaf spot. To harvest, just pinch off the leaves whenever you need them. I always harvest in the morning when the leaves flavour most. You can pinch the mint leaves as soon as the plant grows large leaves. When the plant is young, do not cut the stems, but pluck only the leaves, leaving behind plenty of leaves to encourage the growth of the plant. If you want to have a a large harvest, then don't harvest for a year or so. Just before the plant flowers when the flavour is more intense, cut the stems about 5-7 inches from the soil. I harvest the tips regularly and cut the longer branches, leaving 6 inch behind to keep the plant's growth in check, otherwise it spreads quickly. When there is too much crop, I cut the leaves just before flowering, dry them and store the dried leaves in an airtight container. We use fresh mint leaves for making mint chutney, besides using them in curries for flavour.